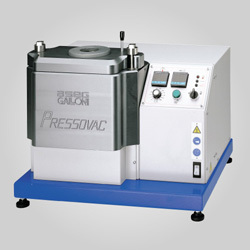 A compact machine that is ideal for industrial, jewelry, and general laboratory soldering applications. Available in 110V or 220V. 220V unit is made to order, please allow an extra 3 weeks for delivery. 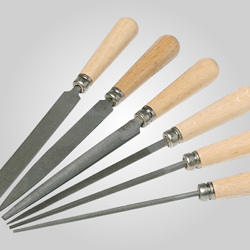 Applies soft or hard solder in seconds without flame for added safety and versatility. 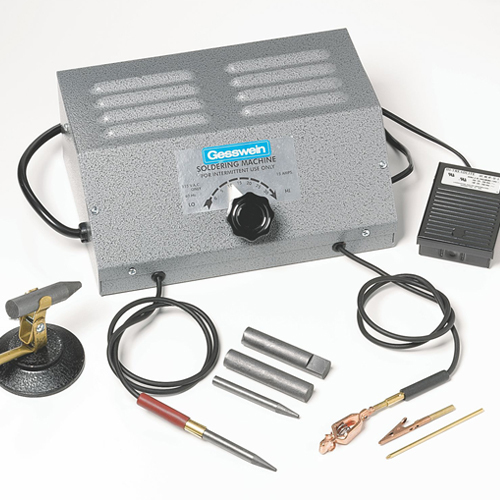 Maximum 1000W system produces adjustable soldering tip temperatures to 2000° F.
Heat passes through Carbon Electrodes to ensure good contact and strong solder joints. Large Carbon Holder can be adjusted to hold Carbons horizontally or vertically for extra convenience. Designed so that both hands can be rested on the bench for improved comfort. Includes Foot Control, three Large Carbon Electrodes, two Small Carbon Electrodes, one Contact Rod, one Alligator Clip, one Bulldog Clamp, and a Stand for the large electrodes. Attractive gray hammer tone console measures 10-1/2" W x 6-7/8" D x 4-1/8" H.
Net weight 12 lbs., shipping weight 16.7 lbs. 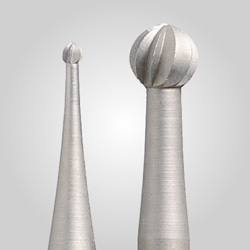 A set of Replacement Carbon Electrodes is also available (see drop-down menu below). Includes 1 of each size: 3 large and 2 small.